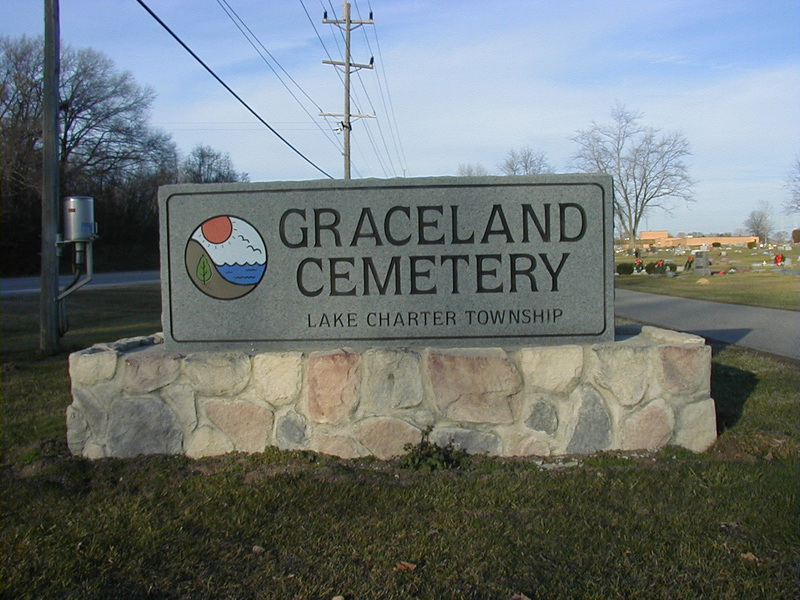 Graceland Cemetery is the newest of the Lake Township cemeteries, getting its start around 1920 and currently contains over 800 stones. The cemetery sits along a well-traveled, historical stretch of Red Arrow Highway and a new addition pays tribute to area veterans. The earliest burial record found is for Gertrude Hartman who was born in 1908 and died in 1920 at 12 years old. Graceland Cemetery dedicated the Living Veterans Monument on Veterans Day, 1999 and more than 500 people attended the ceremonies. The memorial has five concrete columns, representing each branch of the armed forces, and rests on a stone floor imbedded with 216 granite stones, each containing the name of a veteran from the Bridgman area. The names of seven veterans who gave their lives in the service of their country are written on granite stones placed on the columns. A lattice wood roof covers the memorial, giving light and openness to the memorial. The memorial was designed by fellow veteran Lou Whitton, a Bridgman High School art teacher and was organized by the American Legion Post 331 of Bridgman.